I'm Darjan from Zagreb (Croatia) and I want to buy a mid-engined car for the price up to 10k euros and two obvious choices were Toyota MR2 and Porsche Boxster. As I struggled to find a Boxster which is in that price category, I thought I will have to buy MR2, but then a 10k Boxster from 1999 with 67k miles appeared and I went to see it. 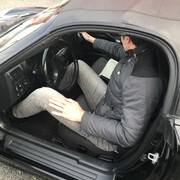 Unfortunately, I found out that cockpit is too small for me (Height - 203 cm or 6'8 and 87 kg) despite being able to fit in thanks to my flexibility, but the steering wheel sits between my legs and prevents me from driving normaly. 1) Buy a more thin racing seat to position myself a little bit more backwards (in that case I don't need seat rails because I will always be as far back as possible). That will also lower me a little bit which is useful for headroom and center of gravity. I planned to buy Recaro Furious 7.0 (around 600 euros) - Do you think I will gain some space with it or do you suggest some other seat? 2) Buy a smaller diameter steering wheel like Sparco F-10A (270mm diameter) or Sparco F310 (310 mm diameter). I'm not sure whill these steering wheels fit when I remove factory steering wheel. If not, what can be done or which steering wheel could I use instead? I accept that I will lose airbags. Last edited by particlewave; 04-01-2019 at 02:36 PM. In addition to thinner racing seats that sit lower in the car many people have also said the GT3 lower console delete helped a lot with leg room, especially for their knees. Keep in mind that the 986 steering wheel only tilts, it does not telescope in and out. You might want to look at a 996 instead. It has more seat travel. If you were thinking of an MR2 Spyder, no way you'll fit at 6'8". Before I started my Porsche addiction, I owned an 01. Very cramped and I'm 5'10". aftermarket steering wheels need specific hubs to work, and sometimes horn and turn signal operation becomes an issue. will also trigger airbag light. momo has history of working with porsche and make hubs for our cars (and steering wheels, or look for an aftermarket wheel with a momo bolt pattern). Thank you all for your answers, I will now have to decide should I buy it or maybe some other car.